I've gotten a little bit behind posting photos. Mostly because what I've been shooting lately hasn't pleased me much. This photo I took a couple of weeks ago on a sunny winter day. 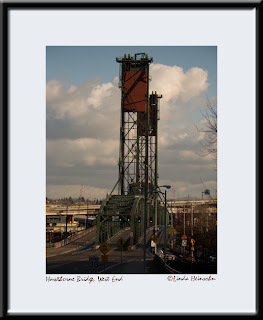 Hawthorne Vertical Lift Drawbridge: Opened December 19, 1910; cost, $500,000; Willamette River mile 13.1; vertical lift 110 feet; center height to water, 53 feet; main span length, 244 feet; horizontal clearance, 230 feet; outside width, 63 feet (four traffic lanes and two 5-foot sidewalks); pedestrians and bicycles allowed. Bridge stats from The Portland Bridge Book, Sharon Wood, Oregon Historical Society Press, 1989.